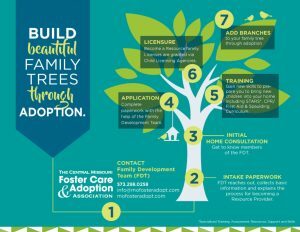 Family Development - The Central Missouri Foster Care and Adoption Assoc. : The Central Missouri Foster Care and Adoption Assoc. Whether you’re committing to a long term or short term opportunity, CMFCAA can help you navigate the process of becoming a foster parent or adoptive parent. All of CMFCAA’s programs are geared toward strengthening, recruiting and retaining quality foster and adoptive homes for our most vulnerable children who have suffered from neglect and abuse. 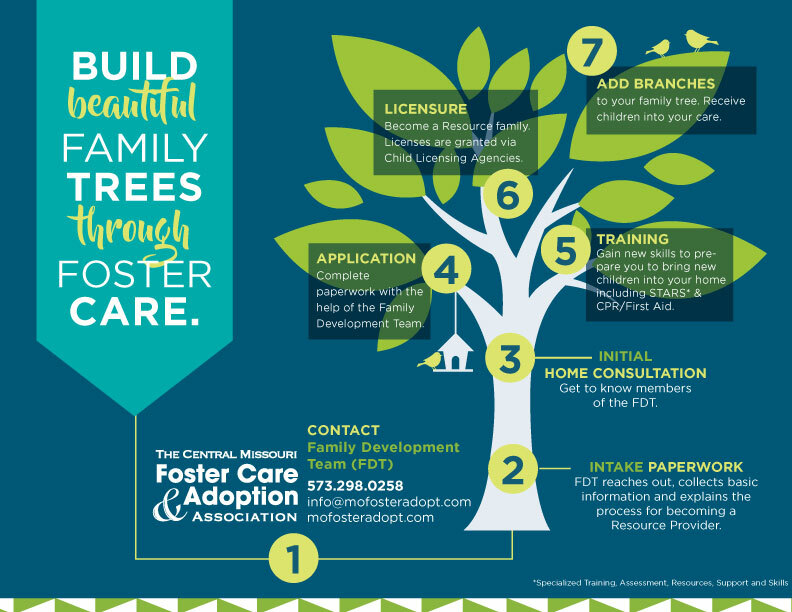 There is little to no cost involved in becoming a foster parent. The home assessment and training is provided by the state free of charge. What does the Family Development Team do? We will walk with you and your family through the pre-service training and licensure process in partnership with other child welfare organizations. We help you get licensed efficiently with the State of Missouri so that your family can begin supporting children in your community. The Family Development program recruits, trains, and supports families who are interested in becoming resource families through foster care, adoption, relative, kinship or respite care. Initial Inquiry: Member of the Family Development Team will talk with you about the process, realities, and opportunities available for your family. Background Screening: Including medical physical reports from applicant(s) doctor. Including FBI fingerprint background, child abuse and neglect, financial stability information, and more. Application: Families complete application materials with support from a Family Development Trainer. Training: Classes will be scheduled in a variety of times/days to allow families to choose a time to enroll in Spaulding classes in addition to STARS training. Home Study: Family Development staff and each family corroboratively complete a home study to better understand how your family can support each other and a new child that joins your family. Licensure: Family Development staff coordinate with child welfare agencies to connect each family with a local licensing agency and maintain support until the family has a child join their family. Advanced Training: Continue your journey with advanced licensure to support older youth, medically fragile youth, and other children with elevated needs. 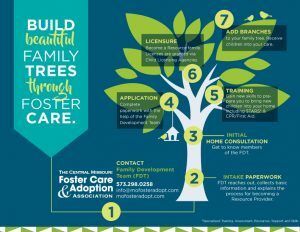 Gain supports through the Family Development Program: We are here to help your family through your journey to build beautiful family trees through foster care and adoption. Complete a lot of paperwork: As part of the licensure process, families get to fill out a lot of paperwork about your family and yourselves. This is in order to fully identify families that can provide safe homes for abused and neglected children. Open up about your life: We ask a lot of questions to better understand your family and how you can support a child who has experienced trauma. We really get to know you and your family through the home study process. We understand that it can be uncomfortable to talk openly about some topics, but we are doing so to better serve children in central Missouri. Learn about trauma: Many children who might join your family have experienced trauma can impact brain development, behavior, and aspects of health. We know that by equipping families with tools and strategies, you can make better connections for children with your family. Have a physical examination: As part of the licensure process, expect to attend a physical exam for you and your family. We will provide your medical care provider with the necessary forms to complete the process. Invest time and commitment into a child: As children join your family, expect to take time to help them transition. It can be frightening and stressful for children to join a new family, so they will need your time, understanding, and commitment to begin to heal. Attend further training after you’re licensed: Resource families are required to attain additional training hours in order to maintain their licenses. The Family Development Program can connect you to some of these ongoing trainings. Check out our class schedule and fill out the application to be accepted into a training class.